... and it is "Steps / degree ". If you don't know this number, you can try setting it at 1 and increasing it until the commanded movement matches the position requested. We will gladly assist should you feel lost at this step. Backlash allows you to deal with the free play in the rotator gearing, increasing accuracy. Depending on your setup, you may prefer it to be applied always, or only in movements in one direction. If you know the real position of the rotator (after a plate solve, typically), just type it in the field at right of the "Set new pos to:" button and press that button. "Set horizontal " is the way to tell the software the camera is in its normal position. Finally, the "Forbidden zone " is an improved way mean to avoid mangling cables and also to avoid equipment hitting. Just define a region where you never want the camera to be (from and to can be the same if just want to avoid mangling cables). To go from 170º to 290º degrees (if the zone is configured as in the example image below) the rotator will go the long way, back to 0º and then to 290º. 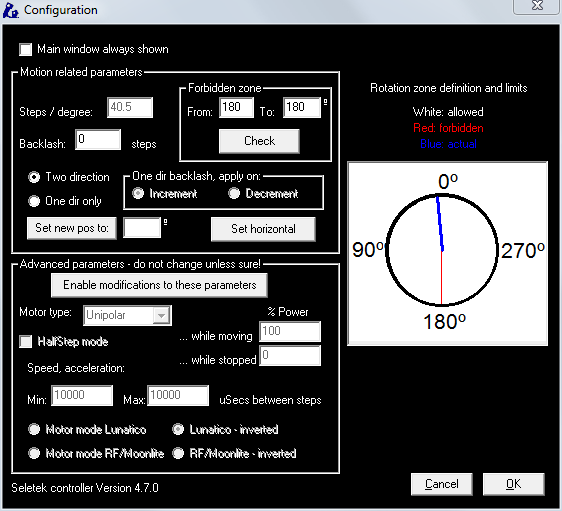 For the advanced parameters, please refer to the " Configuration window " in the focuser documentation, just bear in mind if you are using any rotator equiped with a Robofocus motor, you'll have to select this motor model here. Just of mention here is the existence of Min and Max speed fields (in usecs between steps, so Max will always be equal or lower than Min!). When commanded to move the motor will start at Min speed and accelerate to Max.